If you need packable sun hats to bring on your next trip, you can't go wrong with Shape Flexer. Our packable sun hats are designed for easy keeping and optimum portability. Whether you are navigating the canyon lands or trekking to a mountain peak, you can travel in style and keep your face protected with our packable sun hats. When it comes to flexibility, other packable sun hats can't compare to Shape Flexer. Our team ensures the proper functionality of our packable sun hats by making them with only high-quality materials and employing excellent techniques. We've also added various features to our packable sun hats to help their wearers get the most value for their investment. Our packable sun hats have an adjustable brim. One of the features that make our packable sun hats perfect for traveling is their brim. Customers would be pleased to learn a durable, patented wire supports the brim of our packable sun hats. This allows the wearers of our packable sun hats to adjust the brim to whatever shape they like. Using packable sun hats with a foldable brim, our customers can save themselves the hassle of carrying or wearing an unbendable hat. 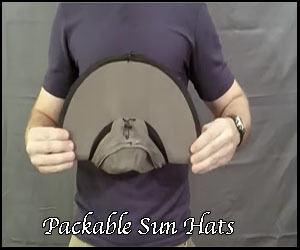 You can adjust the back of the Shape Flexer packable sun hats for clearance when carrying a backpack. If you are playing sports with one of our packable sun hats on, you can adjust its brim so that it stays on your head or doesn't get in your way. Our packable sun hats offer superb portability. You can fold our sturdy packable sun hats in half for hassle-free storing. With this feature, you can fit the Shape Flexer packable sun hats into the smallest of spaces with ease. Gone are the days you let your hat dangle behind you because it's too bulky or fragile to keep in a bag. When you buy one of our packable sun hats, you can avoid cord strangulation and take your hat wherever you want without carrying a large bag. Our packable sun hats are waterproof. Our packable sun hats not only can protect you against harmful UV rays. These products can also keep the rain off your face. We have designed our packable sun hats not to buckle even in a torrential downpour! Our packable sun hats can help keep your face dry when it's raining and prevent the water from landing straight to your backpack. Our packable sun hats have an adjustable cord. We understand that everyone has unique needs in terms of the sizes of packable sun hats. That's why we have created the Shape Flexer packable sun hats with an adjustable cord. Using this band, you can fine-tune the size of our packable sun hats to your liking. If you need to loosen or tighten our packable sun hats, a simple pull or adjustment to the cord is all it takes. Our business owner, Damien Henning, has spent a lot of his time traveling and exploring sun-drenched lands. This kind of lifestyle made him realize the importance of wearing a hat as a form of sun protection. Damien created Shape Flexer because the sun hats he’s tried in the past didn’t meet his needs and expectations. When you purchase the Shape Flexer sun hat, you can have peace of mind knowing you spent your money well. That’s because your hat is made by a traveler who understands the significant role of sun protective headgear in an outdoors enthusiast’s life. A traveler’s kit is never complete without a reliable sun hat. Buy a Shape Flexer sun hat today, and give your face and eyes the sun protection they need during your travels! Our sun hats are available in four exciting colors and three sizes. Contact us for more information about our hats. Sun hats are more than just an addition to your outfit. They protect you against harsh UV rays, which is why these products are important for your health. Find out more about sun protection: https://www.cdc.gov/cancer/skin/basic_info/sun-safety.htm. At Shape Flexer, we have the sun hat that can enhance your getup and provide a comfortable barrier against the summer heat. If you are searching for the right sun hat to wear during your travels, look no further than our Shape Flexer sun hat. Our business owner, Damien Henning, is a well-traveled man. His mammoth backpacking trips would usually last for 3 to 12 months, and he has visited many countries in previous excursions. As a traveler who wanders for days drenched in sunlight, Damien knows the importance of sun hats as protective head garments. However, none of the hats he has tried in the past fit his expectations. This led him to make and design his own sun hat. Determined to create the sun hat that works in various weather conditions and travel circumstances, Damien took up the monumental task of making his dream sun hat. The pursuit had its set of challenges, but Damien plugged away, making several hat versions and notable improvements along the way. His determination paid off when his self-made sun hat began to attract the attention of his fellow travelers. They asked where his hat was from and wanted to get one for themselves. Damien saw this as a profitable opportunity and decided to start a business out of creating sun hats, which marked the beginning of Shape Flexer. We designed our first Shape Flexer sun hat in 2006, and we have been educating ourselves on the design and manufacturing of hats ever since. In this span of time, we have also tested hundreds of combinations of coating and wire and cable types and explored Asia for high-quality fabrics and patterns. If you want a sun hat that offers unmatched quality, portability, and resilience, our Shape Flexer sun hat will not disappoint. This all-purpose, all-weather hat is a product of years of research and the brainchild of a traveler who deeply understands the importance of sun protective garments. As more people gravitate toward an economical lifestyle, wearing our Shape Flexer sun hat is becoming an increasingly popular and efficient means of sun protection. Unlike sunscreens and other sun protection products, our sun hat does not "run out" and require you to buy more. Our team has manufactured our sun hat to be exceptionally wind resistant, and we have made sure it retains its shape through rain, packing, crushing, and washing. If you want to protect your scalp, hair, and face against the sun while being financially savvy, turn to us. You will find that no other field hat can do that job as excellently as Shape Flexer. You can easily fold and fit your Shape Flexer sun hat into small spaces. This comes in handy when you are carrying compact packs or bags. With the Shape Flexer sun hat, you can keep the rain off your face. We have designed the brim of our sun hat so that it does not buckle even in a torrential downpour. You do not have to wash your Shape Flexer sun hat by hand! Simply pop the hat in a laundry machine, and sit back while the equipment gets the job done. The Shape Flexer sun hat has a hidden cape pocket where you can store your money, cards, or other valuables. Do you need the right sun hat for your backpacking trips? Purchase your Shape Flexer sun hat today! This product is available in four exciting colors. If you want to learn more, reach out to us at info@shapeflexer.com.